With the resolution (for now) of the Black Claw chaos last week in “Oh Captain, My Captain,” Grimm signaled a return to form was coming. Our heroes were free to return to their jobs and spice shops, juggling their daily lives alongside the stresses of tracking down a new monster every week. While the better choice for the show’s narrative structure, it also raised some concerns of losing some of the things that made Grimm so compelling in the later stretches of last year, or that the writers would back-pedal on too many of the narrative developments that worked so well. For that reason, “El Cuegle” is exactly the episode we needed at this juncture. It’s a monster-of-the-week episode, but it’s also one of the best monster-of-the-week episodes that Grimm’s had in recent memory, a reminder of the virtues of the format. And while it brushes over some of the recent developments to get us where we need to be, it also doesn’t forget the more important developments and retains the feeling that we’re still heading to some form of conclusion. But despite that appearance El Cuegle isn’t just brute force, as is apparent in the way he comforts the child with his third arm and an almost mournful look on his face, and the way he goes to acquire medicine while dealing with cripping headaches and attendant visions. Grimm’s best monsters of the week are the ones that introduce a sense of moral ambiguity to their actions, the war of their traditions and instincts against the framework of modern life. While not as pitiable as poor Charlie from “Good To The Bone,” El Cuegle—played by Carlos Sanz—manages to deliver a real sense of torment in his human appearances, admitting that his gift of the second sight means he has to make an unforgivable choice. His wesen abilities are as much a power as they are a curse, one that leads to guilt whether he uses them or he doesn’t. Said abilities also introduce a bit of uncertainty on the part of Team Grimm, even if they don’t go so far as to suggest that they should let El Cuegle perform his dirty work. The bulk of last season’s activities against Black Claw were against an obvious villain, where even if their goals of wesen power had some merit their methods were beyond defending. The addition of some ambiguity, particularly coming on the heels of both Nick and Monroe clearly tempted by vigilante justice, is a good thing to see reenter the picture. For all the books they consult, there’s no manual for how they do their job, unless they want to go back to the old Grimm ways of decapitate first and ask questions later. It’s at its best in the closing scene, an ending evocative of The X-Files in the way they establish a sense of ambiguity about the results, the feeling that gains made are all short-term ones and some true understanding of the weirdness around us remains tantalizing out of our grasp. El Cuegle’s death doesn’t provide any sense of closure or resolution to Auggie’s parents—if anything their relationship’s deterioration has stepped on the gas. And while Nick and Hank are able to grasp at the threads of his ominous final words by seeing the baby blanket from the visions, there’s not a thing they can do to act on an uncertain future without sounding like lunatics. And as she dispenses her observations, she does so in a way that keeps the rest of the narratives moving. Her observation on Rosalee’s pregnancy once again brings up the possibility that the changes in their lives will push Monroe and Rosalee out of Portland by the end, which both lets Monroe comfort his wife by way of historical anecdote—always a welcome sight—and remind us that years of fighting monsters does take its toll on good people. And Renard, as much as he’s happy to see his daughter again, is also clearly putting together the advantages of having her live part-time with the man he hasn’t forgiven for ruining his political future. That is if he can get over his hallucinations, as Renard’s vision of Meisner in the closing moment of last week’s episode has now crossed into imaginary friend status. It’s definitely good to see Damien Puckler return to the fold in the final season, and getting to play a somewhat different version of his character, this Meisner more prone to dark humor and confrontation in a way he never was in life. (Death has apparently played with his voice too, as his accent work this episode is hilariously inconsistent.) And adding him to the mix also gives Renard a foil, an important move as he’s largely cut off from every other cast member beyond impotent threats and snippy dismissals. The weak link of the narrative remains Julievette, who spends her time in the tunnels trying to get a handle on the Splinter of Destiny and getting burned for her efforts. While she’s found ways to renew her relevance to the plot before in the arcs of Dark Juliette and Eve, all her actions this season feel like a character who’s exhausted her narrative use and the writers don’t know what to do with her. Latching her to the spinning wheel of the mysterious symbols on the Cloth of Cipher (new working title) is a marriage of ambiguous plots, which isn’t doing much to move either forward. Both need to be resolved at some point, but if they’re going to put that resolution on hold for more cases of the week like “El Cuegle,” I can’t say that’s the wrong move. This Week In Portland: Renard angrily reads the latest issue of the Portland Tribune for the front-page story on his mayoral abdication. This Week’s Epigram: “Foretold our fate, by the gods’ decree, all heard and none believed the prophecy.” The words of Trojan prophetess Cassandra from The Aeneid, whose dire warnings went as unremarked upon as El Cuegle’s. Incidentally, the couple in question is located on NE Cassandra Street. Know Your Wesen: No recurring wesen this week. However, El Cuegle’s depiction in the Grimm diaries is clearly inspired by Francisco Goya’s Saturn Devouring His Son. Renard’s angry call with the Black Claw representative likely isn’t the last we’ve heard of that evil organization. Though it does give Sasha Roiz two welcome opportunities to say Verfluchte Zwillingsschwester. 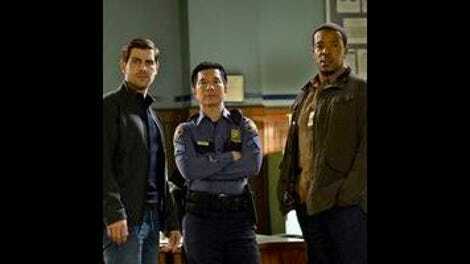 Also in enjoyable Renard interactions, his “welcoming” Nick, Hank, and Wu back to work. The smugness of the trio is delicious. So with the destruction of Hadrian’s Wall, Julievette is essentially homeless. Did no one offer her a place to stay and that’s why she’s apparently living in the tunnels? We know Monroe has a spare bedroom and there’s a bed in the spice shop. Future Auggie’s decision to wrap his gun in his baby blanket is a clear sign this kid will care way too much about making a statement. It didn’t even seem to have any silencer potential. “Their social media addiction sure made them easy targets.” “Time for some book time.” I feel like there’s a hidden message in the order of those statements.